The Boeing 787 is certainly a revolutionary step from anything Boeing has done recently – and from anything else Boeing seems to have planned in the future it would seem, judging by the 737-Max. From what I can glean on the web, the 737 Max while incorporating some revolutionary technologies in the engines and airframe – is essentially a 737NG on the flight deck, and certainly several steps behind the 777 – which entered service 17+ years ago in 1995. South West being the launch customer for the 737 probably has something to do with that, as well as minimising the training for all the 737 pilots in the world – you’ve gotta love legacy equipment … but I digress. 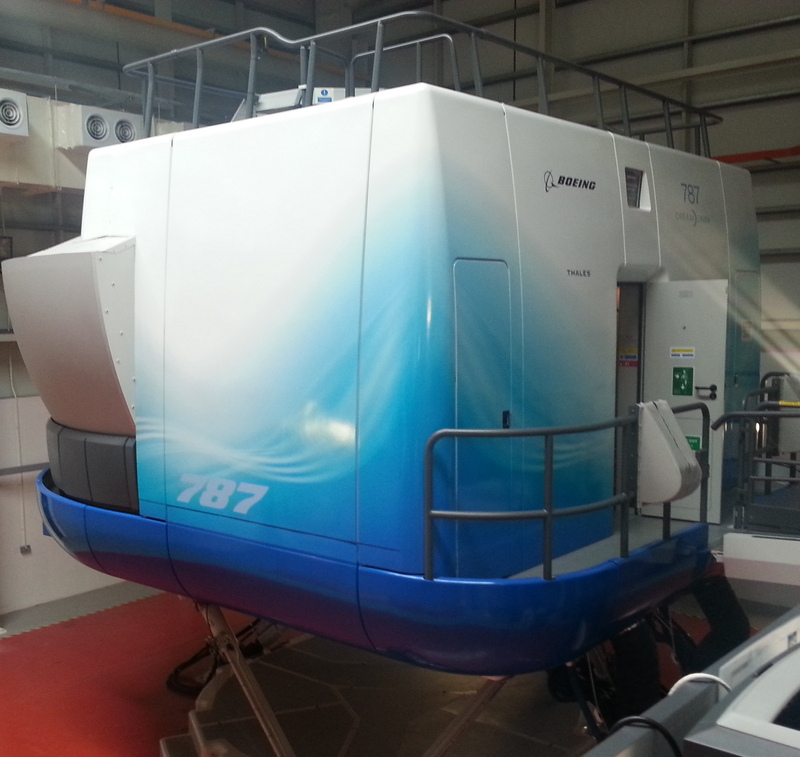 I was recently in Singapore viewing the new Boeing Training Facility, their 777 simulator and other facilities. Purpose built, the facility was impressive and a clear sign of Boeing’s commitment to the growth of Asian airlines and their orders for lots of Boeings. Of particular interest to me are the procedural trainers that Boeing have in place. It’s easy to see how these wonderful devices can be used to supplement and replace fixed base simulator sessions in the transition syllabus. Flows can be practised and with the addition of in depth system displays that respond to panel selections and programmed systems failures – this brings a low cost alternative to the use of a very expensive full flight simulator, without the distraction of motion and visual. I should think will in the very least provide equal training value (you’re always pressure for time in a Simulator) with the potential to produce better outcomes given good instruction. Students transitioning onto the aircraft can sit with their partner and review the lessons ahead of time, maximising the potential learning benefit when they do enter the full flight simulator. 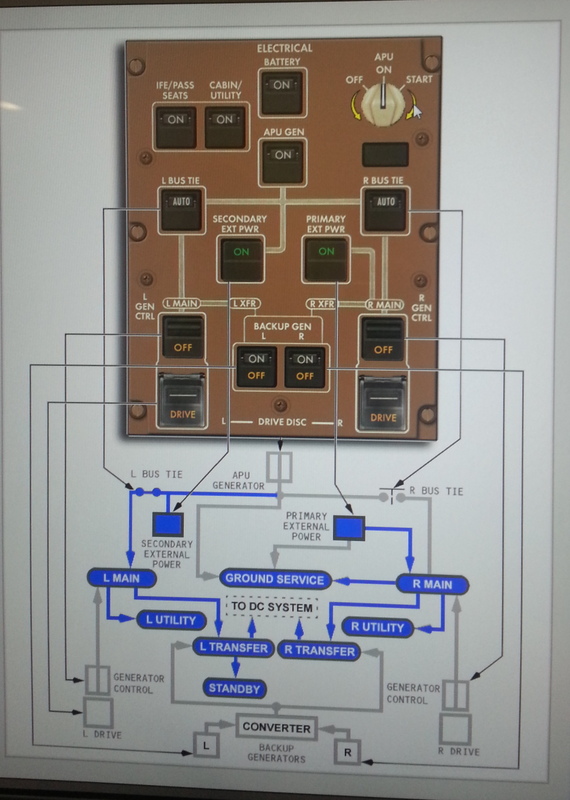 The picture on the far right is a screen short of an overhead panel segment with a live systems display that responds to switch selections and other system related events. What a fabulous addition to a training center. While the 777 simulator was familiar, and the 777 ground trainer a pleasant surprise … I was there for a promised ride in the 787 … which we eventually got to. There’s no end of detailed reviews and videos on the 787 on the web – I wasn’t in the sim long enough to compete with those, and having not done any training on the aircraft – we didn’t even see a non-normal – I wouldn’t even try. This is just a touch and feel write up. 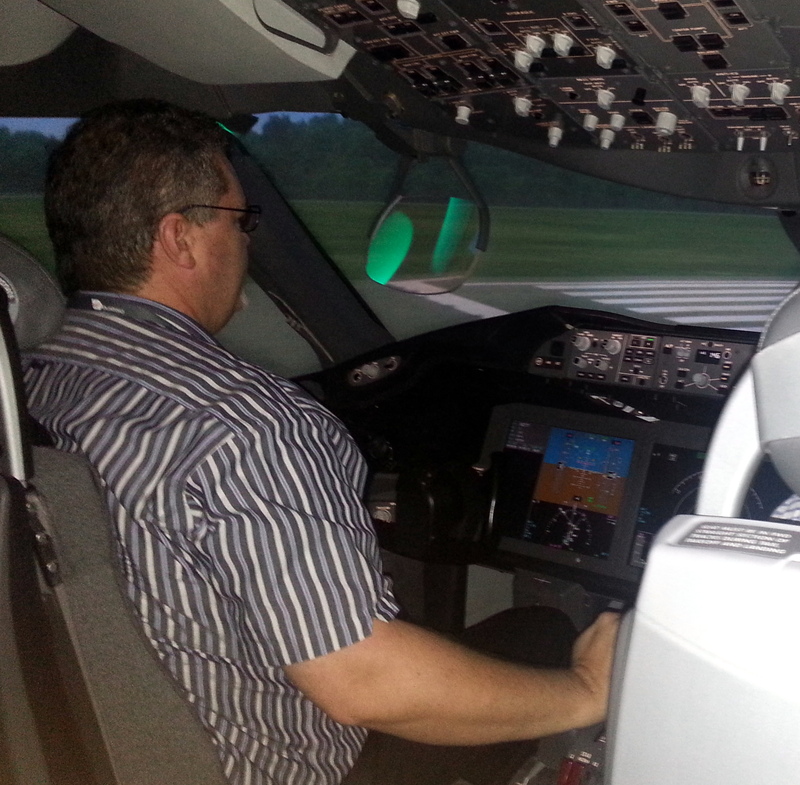 I suspect we were all looking forward to the 787 sim. I’ve done quite a bit of reading about the aircraft, and have several friends who are either flying it already or are instructors/test/delivery pilots on the aircraft. Jetstar and Qantas are getting them this year (we saw some JSQ pilots in Singapore on conversion courses for the 787) and there’s a remote possibility Virgin may eschew the A350 and order B787’s as well (although I’m not holding out much hope personally). The flight deck was pretty much as I’d expected to see, with the exception of the HUD ( Heads Up Display ) – I’d completely forgotten about it. Stu has flown and trained on the HUD before but I haven’t encountered one. To be honest I approached it with trepidation and in fact kept putting it away. I was focussed on getting the most of the 787 as a 777 pilot – seeing what came of those skills thrown into the 787 as it were. I wasn’t disappointed but used the HUD for my last circuit. As a 777 pilot – the displays were simply a joy to behold. Pure Boeing with nothing of that half-finished look Airbus screens all seem to inherit. The central EICAS screen has gone and been replaced by two large PFD/ND screens in front of the pilots. Half of the ND is taken by the pilot who has the EICAS display up – nominally the PF although I suspect this will come down to an airline determination for the most part. As the PF I wanted EICAS over on the PM side so I had that enormous Nav Display – until I was asked to look for something on it, at which point I could see the benefit of the PF not having to stretch across to look. For the Boeing pilot – the screens are purely evolutionary here – a clear, thoughtful developmental process onwards from the 777 displays. Some of the features were a joy to behold, such as the RNP envelope indication on the ND and the vertical profile display. Our 777’s don’t have this (even as our 737’s on the domestic fleets do, for the most part) and the vertical situational awareness benefits it brings are immediately apparent. I can’t speak much to the handling, I just didn’t see enough of the envelope. Being only Boeing’s second fly by wire commercial aircraft (?) (unless you count the 777 several times – 100, 200A, 200B, 300, 300ER, 200LR, 200LRF, etc) I would not have expected much variation from the 777 and didn’t find any. Ground handling (as much as it can be in a sim) was conventional. Acceleration on the runway was impressive (as it always in in an empty aircraft) and I managed the first rotation without to much “staging”. Everything after that was entirely conventional and once again, like slipping on the 777 glove. As always I’m sure there were hundreds (thousands!) of little bits of software code working away to make the flight easy – and it was. Paul or Stu thought it was a bit touchy in pitch – I can’t speak to that. It was lovely to fly. 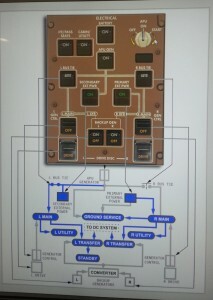 I flew my first circuit without the display. I just wanted to enjoy basic flight without the gadgets (Ha! 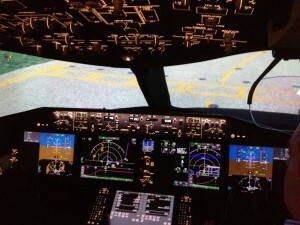 No gadgets in a 787 – Sure!) However downwind I lowered it into place and started exploring. As someone who flies with glasses on, I initially found the HUD something of a challenge. Apart from focussing issues (which were mostly in my mind, in retrospect), I had difficulty in obtaining the exact seating position that revealed the entire HUD. I kept finding that either the FMA at the top or part of the compass rose at the bottom went missing. On one of the videos below, I moved the camera around to give you an idea of what I was initially experiencing. As an instructor who has “debriefed”a vast number of pilots for seating position in the 777 over the last 10 years , the irony was not lost on me. Eventually I found my spot. Should I ever end up instructing in the 787, I’m clearly never going to have to discuss seating position with the pilots I train. If they can see the HUD, they’re in the right position. If they can’t – they’re going to have to get into the right position, and that’s the end of it. Paul flew his entire first circuit (radar vectored ILS) on HUD alone and did not find it challenging. By all means we would get more from it having done a HUD training package first – I was still finding additional prompts and information highlights in the HUD late on final. I was fortunate enough to be given some time in the e-Jet sim last year and there were thrust and speed assistance mechanisms on the e-Jet PFD that are strongly reminiscent in the HUD. It’s a great bit of kit – my last approach was in Cat 2 weather with a manual landing at the bottom and the HUD certainly comes into it’s own in this environment. I took a couple of videos of the HUD during Paul and Stu’s flight. If you’re interested – there are far better videos on YouTube and I suggest you go look at those. Unfortunately there wasn’t time for much more than that – we’d spent too much time (as far as I was concerned!) 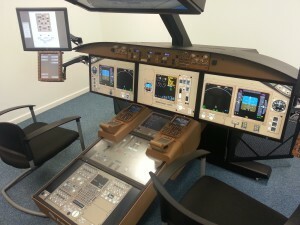 reviewing the Boeing facilities – the reason we were there! – but I’m certainly looking forward to my next encounter with the 787.